Property 1: Luxury Wood Cabin set in the tranquil Suffolk Countryside. The cottage is well looked after and stocked with everything we needed, and is positioned in a peaceful and private location. The owners are lovely and quick to respond. 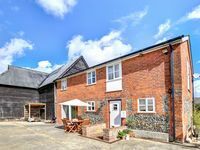 Long Melford and Sudbury are a short drive away, both offering a multitude of amenities, and there are lovely walks from the cottage - we spotted a few deer and a hare, and there are horses, pigs and sheep in the near distance. We enjoyed bird watching in the daytime, and star gazing in the late evenings. Our children loved playing in the garden; they had plenty of space in which to run! 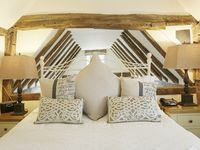 We highly recommend Rowhedge Farm Cottage as a comfortable, relaxing break.